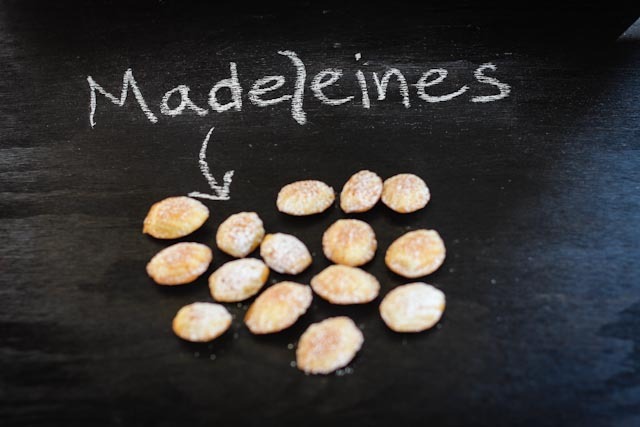 Madeleines can be a very versatile pastry because they can be eaten any time of the day. They are great for breakfast with coffee or tea, they make a great brunch addition, and I love having them in the evening after dinner with a good craft beer. The recipe allows for a ton of experimentation with different spices and citrus so they can have endless possibilities Adding beer in place of vanilla and/or fruit juice creates another dimension of flavor and aroma which was pleasant and intoxicating (not literally). The texture is crunchy on the outside and soft and cakey on the inside. They remind me of little doughnuts but without the fried aspect. If you don’t have a madeleine tray I highly recommending getting some. 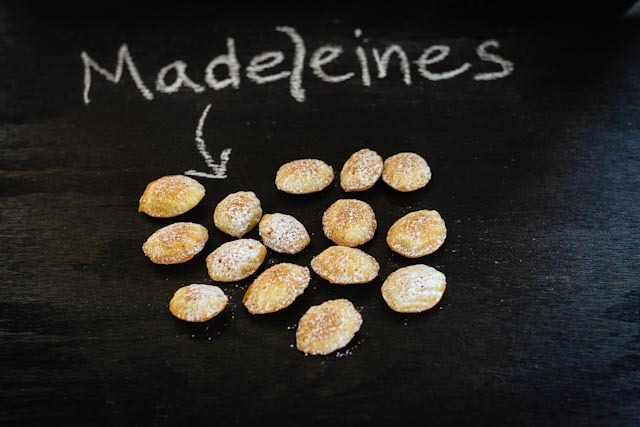 I have two regular-sized madeleine trays and two mini madeleine trays. I used the mini trays for this recipe because I wanted to be able to share more of them, but people just ate two or three anyways! 1. Sift together flour, baking powder, and salt in a bowl. I always cheat and put the salt in the bowl without sifting, it gets stuck! 2. Put eggs, egg yolks, sugar, vanilla (or beer), beer (or citrus juice), and zest in an electric mixer with the paddle attachment and mix on medium-high for 5 minutes. You can also use a hand-held electric mixer with the whisk attachment, I don’t see why it wouldn’t work just as good. The mixture stays very loose but turns more pale in color. Mix in butter (should be room temp, but you can zap it in the microwave for 45 secs and achieve “room temp”). Take off the mixer and fold in the flour mixture with a spatula. 3. I know, folding in flour into anything is a pain. It’s a chore, but it’s worth it. 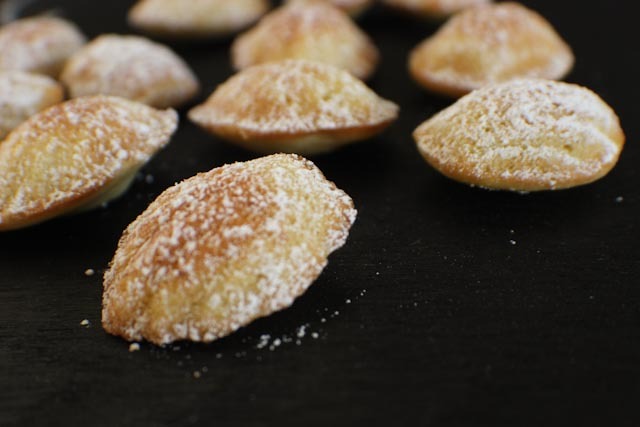 If you whisk in the flour or rush the incorporation the batter gets tough and makes the madeleines too firm. So I just fold the batter from the side of the bowl into the middle, fold from the side into the middle and repeat. The process feels like it takes forever but making sure there are no flour bombs is essential. Once the batter is done, put plastic wrap on top and place in the fridge to sit for 30 mins. Melt a little butter and butter your madeleine tray and place in the fridge to set while you are waiting. 10 mins in the fridge should be enough to get the butter hard enough. 4. Preheat the oven to 350 degrees F. Take your batter out of the fridge and using two small spoons take little scoops of batter (about 1 teaspoon for mini trays and 1 tablespoon for regular trays) and place in the little reservoirs. They do spread while baking so be mindful not to over-fill. 5. Bake for about 7-10 minutes. I would bake for 5 minutes, rotate the trays, then set your timer for 3 minutes and check them. 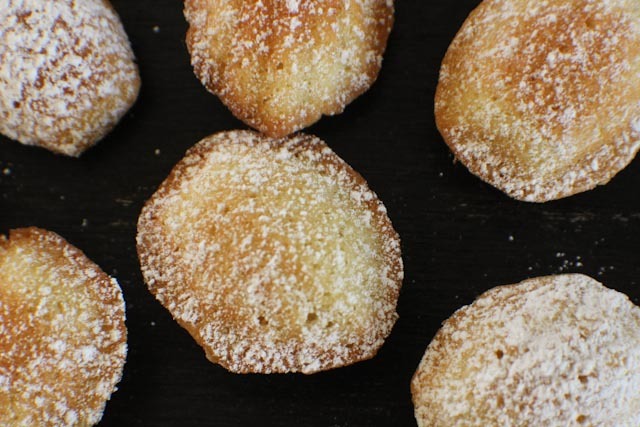 I happen to like my madeleines with color and crunch, so I cook them longer but you might prefer them a little less cooked. It’s all about preference. After they are done, let them sit in the tray for a few minutes and then place on wire racks to cool. After the madeleines cool to about room temp, you have the option to dust with powdered sugar or dip in chocolate or brush with a frosting glaze. 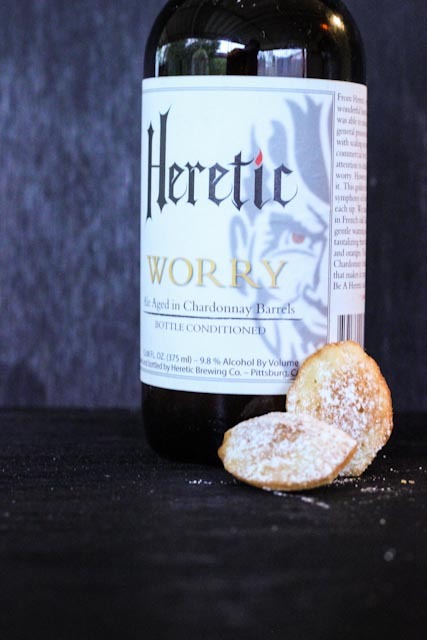 When thinking about what beer I wanted to add to this recipe I did some soul-searching in our beer fridge and decided on Heretic Brewing Company’s Worry. This 9.8%ABV Belgian strong ale aged in Grgich Hill Estate Chardonnay barrels has a light citrus oak flavor with a very slight alcohol burn. It seemed like the perfect complement to lemon zest. The beer added a sweet floral smell that enveloped the house into decadence while baking these little beauties. Let me know what you think and if you make them how they turn out!